Where will the dead ends be? Will they be along the optimal path to the evacuation room or will they be off of the optimal path to get dead ends back on? If dead ends are along the optimal path, how will the robot know to continue along a new path and not just reverse its way back to the start? It seems that it would be impossible to get to the evacuation room if there was a dead end along the path, forcing the robot to turn around. Interesting question which I had to think about for a while! The dead ends can be located anywhere. Note that if the robot does not follow the indicated path it is a Lack of Progress. I was reading the 2017 rules and I came across the dead end section. I was wondering how the robot would turn. I know that the dead end is indicated by two green squares. My question is... Is it possible for the dead end to lead straight into a wall? I am concerned about this, because if the dead end does lead into a wall, then when turning the robot has a possibility of crashing into the wall and getting stuck. Also, how large are the green squares indicating that it is a dead end? The fields will most probably not have any walls. They have not have walls since Brazil 2014 (if I recall correct). But if they have walls, they may be close to the dead end. Best practice is to check if there is enough space for the robot to turn around and make space if not. For example checking distance forward and if a wall is to close the robot can back the same way it came and turn around further away from the wall. Can a dead end placed just before the entrance of the evacuation zone? That prevents the robot to enter inside the victims place. 1.7.1	The	black	line	will	end	at	the	entrance	of	the	evacuation	zone. But if there is a dead end immediatly before that "final" black line? I do not notice any rule that prevent to put dead ends in that way. Am I correct? In other words ... is it possible that in some arenas the robot cannot go inside the evacuation zone because dead ends? yes, it is theoretically possible, that a dead end prevents a robot from entering the evacuation zone but I can not see a reason why a field designer should place a dead end on the tile immediately before the evacuation zone. 1.5.4 A dead end is when there are two green marks before an intersection (one on each side of the line), in this case the robot should turn around. It is clear that the robot should turn around every time it faces two green marks, therefore the robot could not enter the evacuation zone. The location of a dead end on the tile before the entrance of the evacuation zone does not make any sense to me. If you look at the last paragraph of the summary, it seems clear to me that the evacuation of victims is a substantial part of the Line competition – if the robot would not be able to enter the evacuation zone, it would not be able to rescue any victims – therefore I strongly recommend any field designer to not place a dead end immediately before the entrance of the evacuation zone. At the end of the line there will be a rectangular room with walls (the evacuation zone). The entrance to the room will be marked with a strip of reflective silver tape on the floor. Once inside the evacuation zone, the robot should locate and transport as many live victims (reflective silver balls of 4-5 cm diameter that are electrically conductive) or dead victims (black balls of 4-5 cm diameter that are not electrically conductive) as possible to an evacuation point in one of the corners of the room. The robot can earn between 15 to 40 points for each victim depending of the difficulty level. 1.7.1 The black line will end at the entrance of the evacuation zone. As Jennifer said in her answer, the rule article 1.5.4 says that " A dead end is when there are two green marks before an intersection " in your picture, you shows a dead end without an intersection. 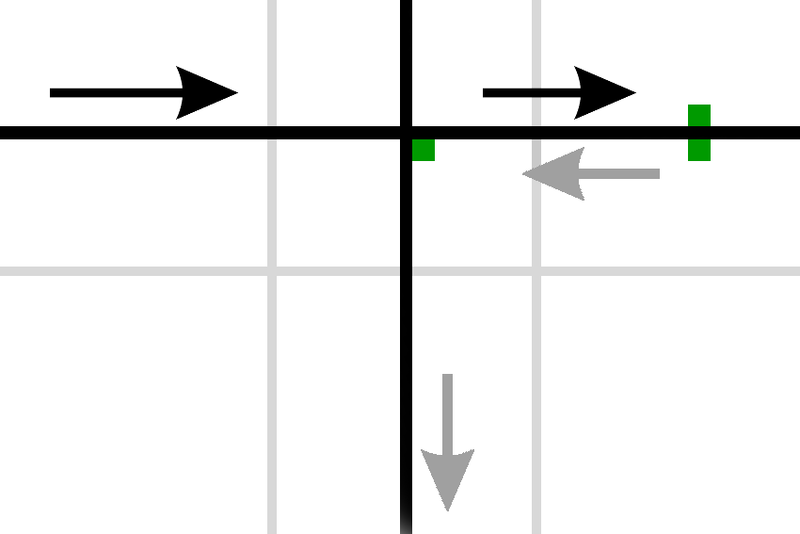 I don't think should be valid because if you put just one green mark in an straight line without intersection (For example), the robot have to continue in the line, because there is no other path to follow. In resume, it breaks the logic of some algorithms. Also check the picture below that is in the rule, following your logic, if the robot goes from C it should return to C and not go through A, I think.